With this week’s decision by the Obama Administration to extend the life of the International Space Station until 2024, I figured it was time for me to create a “Best” list on the facility. It’s a quick one for now, and I’ll be adding more over the coming weeks. Of course, I invite readers suggestions, too! Deconstructing The ISS is a neat interactive about the International Space Station from The Washington Post. 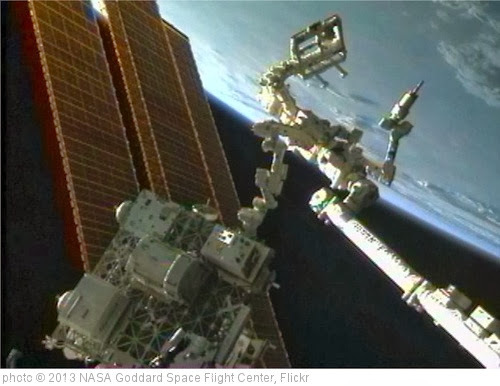 I have a ton of videos and images take from the station on The Best Images Taken In Space list. NASA has created an amazing slideshow of the International Space Station compiling photos taking from a recent Soyuz flight. The New York Times has a nice interactive timeline called “Assembling The International Space Station.” USA Today has a similar graphic. The Boston Globe has some pretty amazing images of the International Space Station . Google Street View now lets you explore every nook-and-cranny of the International Space Station. You might also be interested in A Collection Of “The Best…” Lists On Space.